Lets hear if for Sheriff Joe from Arizona. I don’t know the circumstances about this photo but, some photos speak for themselves and this is one of them. 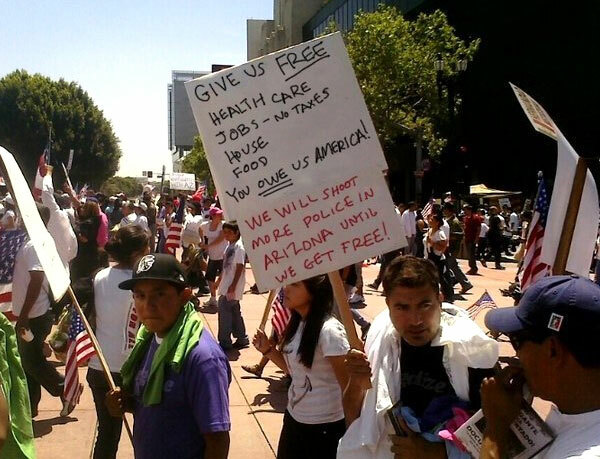 The poster says “You Owe Us America” and they seem to indicate they will kill law enforcement officers until we give them what they want. So, my question is this : If I were to break into your house, how much would you OWE ME. You wouldn’t just kick me out of the house, you’d call those law enforcement officers and they would put me in jail. Funny thing about this is, if they haven’t noticed, that Law Enforcement has a good habit of shooting back. If these lazy good-for-nothings would like to find out just how many of us are willing to back up our Laws and Law Enforcement Officers, just go ahead and take that first shot. WE OWE YOU N-O-T-H-I-N-G! This country owes you NOT-ONE-DAMN-THING!! If you march in groups it will just make it easier to round up your silly asses and send yopu back to where you came from. AND, if you’re really silly enough to take that first shot, WE’LL SEND YOU TO HELL! Next PostNext What Rights do we REALLY Need?